The industrial reign of the fibre laser has been underway for several years now, thanks to its high beam quality, superior wall-plug efficiency and low maintenance requirements. The benefits of the technology are far from being limited to these parameters alone, however, and the delivery method is just as advantageous in a number of dynamic, robot-assisted metal processing applications. The extensive reach offered by a narrow, flexible fibre makes fibre lasers the ideal choice when delivering light to areas that are hard to access, as Rolls-Royce is currently demonstrating with its latest repair technology for aerospace engines. Rolls-Royce inspects its engines thousands of times every year to find signs of wear and tear, such as damaged compressor blades in a turbine. When a part is identified that needs maintenance, rather than removing and stripping down the entire engine to repair the damage, Rolls-Royce has instead been using blending scopes to grind the compressor blade layer-by-layer into a smooth scallop shape that leaves the aircraft safe to fly. These rigid methods are quite limited, however, according to James Kell, on-wing technology specialist at Rolls-Royce, because an inspection port needs to be situated right next to the damaged area on the compressor blade, which isn’t always the case. Rolls-Royce and some of its partners have therefore developed an alternative repair method consisting of a small, flexible, fibre-fed laser probe and a deployment device that form a snake-like robot. The robotic probe can perform blending repairs inside an engine without needing direct access through an inspection port. The miniature optical head at the end of the fibre, developed by optoelectronics manufacturer Optek, contains a number of focusing optics and a steerable mirror. The fibre laser itself, also provided by Optek, sits outside the engine and delivers its light to the optical head through the flexible optical fibre, which is approximately five metres long, according to Kell. Before a repair can be carried out, the size and depth of the damage is first determined using a scope equipped with either stereovision or point cloud technology. This information is then entered into a computer program, which drives the mirror through the tool path to conduct the repair. The process is monitored using third-party imaging equipment inserted through the next closest access port, similar to keyhole surgery. Rolls-Royce is also investigating putting additive manufacturing capabilities on its snake-like robot, as there is a limit to how much material can be removed in a blending repair before the structural integrity of a compressor blade is compromised. In theory, according to Kell, repairs made with the flexible laser probe could one day take place remotely from Rolls-Royce’s availability centre in a completely different part of the world to the engine. ‘We’re moving more towards this remote maintenance and being able to make repair decisions more quickly,’ he said. The company is still in the process of internally validating the new method, and is very close to including it in the suite of repair solutions it offers. ‘This is the year where we will begin using the laser boreblend scope over traditional blending methods,’ Kell confirmed. 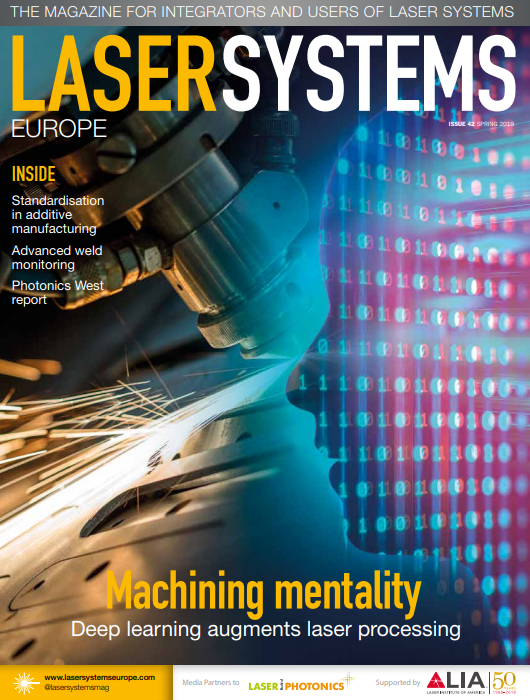 The combination of fibre laser and robot is already well established in automobile production, but according to Michael Kuhn, European manager of laser technical sales support at Fanuc, the full potential of the technology is yet to be reached. ‘The capabilities of a laser process are limited by the robot itself. As it stands, there are some limitations in terms of dynamic path accuracy and repeatability with robots, as their kinematics are designed mainly for handling purposes, where micron-scale accuracies are not that important,’ Kuhn said. ‘For cutting applications, however, accuracies of 50µm or less become important, but this cannot currently be achieved with available robot systems. Improving the accuracy of robots is therefore key. Kuhn observed that robots probably won’t be able to match the dynamic path accuracy of Cartesian machine tools, but that engineers at Fanuc are ‘on the way to coming close to this’. In cooperation with its parent company Furukawa Electric, Fanuc launched its own fibre laser technology in 2015, the power of which ranges between 500W and 6kW, with the firm planning to go beyond 6kW in the future. As the company also develops CNC controls and drive technology, Fanuc is in the rare position of being able to produce dedicated functions and interfaces for laser cutting and welding, which together increase the efficiency of such robot-assisted processes – the high control speed gave short latency times between the power command and execution of its lasers. In the future the firm also plans to integrate a scanning unit into its systems to help bring their accuracy closer to that of Cartesian machine tools. ‘We are going to implement the robot, laser and scanner control in one device, and this gives a lot of advantages on the market,’ said Kuhn. Direct diode lasers are also gaining interest in industry, but they are yet to match the beam quality of fibre or CO₂ lasers. Of particular interest to machine integrators, however, is the opportunity presented when direct diode lasers are combined with robotics. ‘Direct diodes are very compact, as their housing is quite small, which means they can be easily connected to, or carried by, a robotic arm,’ explained Kuhn. While a fibre laser is normally separate from a robot arm, with its light guided through a flexible fibre to the processing head, a diode laser can be integrated directly onto the arm. This could bring benefits such as a smaller physical footprint, higher flexibility and higher reliability, according to Kuhn. Robot-assisted welding is in high demand by the automotive industry, with technology firms such as Blackbird Robotersysteme experiencing particular interest in its systems for manufacturing hang-on-parts, seat parts and heat exchangers. To ensure manufacturers are achieving high-quality, high-precision weld seams, Blackbird’s partner Scanlab has developed a real-time monitoring solution that, together with Blackbird’s own Scan Control Unit, enables full, on-the-fly seam monitoring and laser spot adjustment. Designed for mounting on robots such as those from Fanuc and Kuka, Scanlab’s IntelliWeld 3D scan system is capable of positioning a laser beam along the 3D contours of automotive parts. Manipulating the beam keeps any robot movement to a minimum, which is ultimately a faster process as weld-to-weld positioning times can be reduced to a few milliseconds. The IntelliWeld features prefocus optics that are optimised for fibre-coupled disk lasers, or fibre lasers with powers up to 8kW, and enable precise contour tracking for fillet welds. Scanlab’s newest addition to the IntelliWeld family, the IntelliWeld II, also offers an integrated zoom axis, which makes it particularly well suited for overlap welding, as its variable spot size can weld flexible seam widths. Both the IntelliWeld and Scan Control Unit are currently being combined with optical coherence tomography (OCT) to enhance automotive welding applications as part of the RoKtoLas project – ‘Robot-supported, scanner-based optical coherence tomography in remote laser welding for process chain flexibility in body construction’. Together with TUM’s Institute for Machine Tools and Industrial Management, BMW, Emil Bucher, Application Technology and Precitec, Blackbird Robotersysteme and Scanlab are investigating how OCT technology could provide more flexibility in automotive body construction, particularly in electromobility. The project will combine an OCT scanner – employing single-point high-speed distance measurement based on interferometry – with additional photonic sensors to inspect weld seams using integrated edge tracking and seam topology measurement. The solution, known as xHawk, will give measurements ahead of, within, and past the laser process zone, identifying potential weld defects such as inadequate width, penetration, open pores and faulty positioning. Fraunhofer ILT has also developed its own robot-assisted weld monitoring solution for welding prismatic, round and pouch battery cells. Known as LaserTAB – laser-based tape-automated bonding – the monitoring solution features a pyrometer, a co-axial camera, a relay-optic and a mounted spacer, all fixed to Kuka’s intelligent industrial work assistant robot. 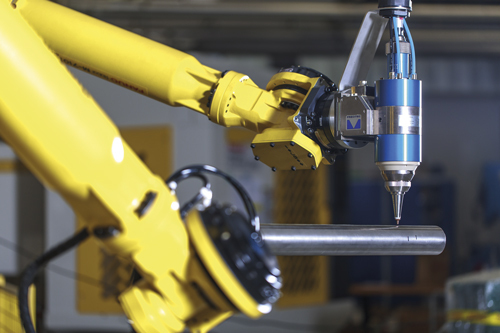 Similar to Fanuc’s technology, an external single-mode fibre laser delivers light through a flexible fibre to the optical head mounted on the robot. The integrated spacer is a tool that maintains a fixed distance between the optics and the point of welding, ensuring that the focal length required for the process is met. The robot is then able to ‘feel’ the moment the spacer touches the workpiece and start welding. A 1kW 1,070nm fibre laser is used in this instance. The system’s relay optic is designed to extend the optical system and enable a deeper immersion depth for welding battery pack parts that are difficult to access. At the moment LaserTAB is guided to the welding point by hand, but Helm explained that it could one day be taught various welding positions, meaning a human would then need to simply supervise the automated production and only correct the position when necessary. Fraunhofer ILT will be demonstrating LaserTAB on 3 May as part of the international laser congress AKL in Aachen, Germany. The technology was also demonstrated last year at the Productronica trade fair in Munich, Germany, where it was used to connect a copper contact element to a round cell.